Brad Tollefson, Carlos Silva and Nicholas Talbot of the Lubbock Avalanche-Journal won first place in the Associated Press Sports Editors 2017 contest in the Long Video category for the Under 30,000 circulation division. Tollefson, Silva and Talbot won for their video on how the football coaches from Estacado High School go above and beyond to help their players. The winner in each category will receive a plaque at the 2018 APSE Summer Conference in Nashville. The banquet and awards dinner will conclude the APSE Summer Conference, which takes place June 17-20 at at the Marriott Hotel Nashville / Vanderbilt University. Tollefson, Silva and Talbot beat out runner-up Mike Foster of the Wilmington StarNews. Bret McCormick of The Herald (Rock Hill, SC), placed third. 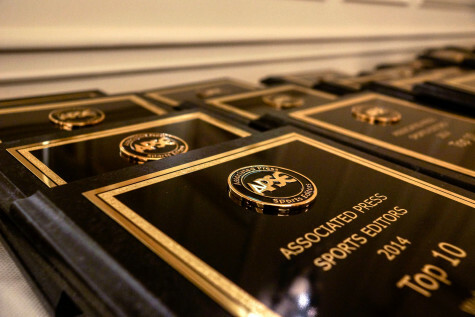 Sports editors in the Under 30,000 category submitted seven Long Video entries. The contest is open to APSE members. Click here to join. Contest chair John Bednarowski and fellow APSE officers Jeff Rosen, Todd Adams and Robert Gagliardi numbered each entry, assuring they had been stripped of headlines, graphics, bylines and any other element that would identify the writer or news organization. In February, preliminary judges at the APSE Winter Conference in St. Petersburg, Fla., and off-site around the country, selected a top five, with each judge ranking the entries in order from 1 to 3 separately on a secret ballot. Entries were given 3 points for a first-­place vote, 2 points for second and one point for a third­-place vote. The final three were given to a second judging group, which ranked the entries 1-3 in the same fashion. The winner and final rankings are determined by tallying the ballots. The Long Video category is for videos more than 5 minutes, with entries judged, foremost, on the strength of storytelling. Visual and auditory quality are also considered. The top 3 is listed below, with links to writers’ Twitter pages, APSE member websites and winning entries.